So you think people in present-day Sweden and Norway are different from each other? It turns out that would have been closer to the truth some 9500 years ago. Directly following the last ice age, people from the western parts of what is now Norway were a population that had substantially different genetics from the people living in the area corresponding to present-day Sweden. 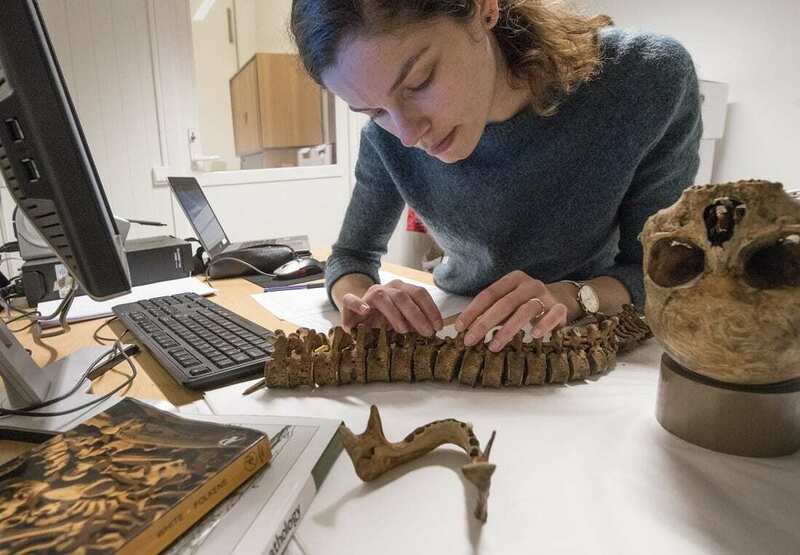 “We were surprised that the results showed such marked dissimilarities,” says associate professor and archaeologist Birgitte Skar at the Norwegian University of Science and Technology’s (NTNU) University Museum. Skar is responsible for the museum’s Stone Age and Bronze Age collections. Scandinavia was one of the last parts of Europe to become habitable when the glaciers released their icy grip more than 10,000 years ago. The ocean’s resources and the coastal archipelago attracted marine hunter-gatherers of yore to the region. Swedish and Norwegian researchers have collaborated on analysing the DNA in 9500-year-old bone samples from the southern and western Norwegian coast and from the Swedish islands of Gotland and Stora Karlsö. This period corresponds to the Mesolithic Stone Age. Researchers examined seven excavated individuals and compared their genetic material with samples from other parts of Europe. “People from the Norwegian south and west coast were genetically similar to populations east of the Baltic Sea that came from today’s Russia. People from eastern Scandinavia – present-day Sweden – were more genetically similar to populations from central and western Europe,” says population geneticist Torsten Günther from Uppsala University. He is one of the main authors of the new study. This finding may seem strange if you just look at the geography, but it may due to multiple waves of migration to Scandinavia. About 11,500 years ago, people migrated from the south, through Germany and Denmark and then by sea to Norway. About 1000 years later, people traveled from the northeast and followed the Norwegian Atlantic coast southward. “To understand the migration routes, it was essential to obtain data from the Norwegian individuals,” explains Skar, co-author of the study. The Norwegian skeletal remains from southern Norway are also the oldest of the individuals studied. Over time, the various migration waves led to extensive contact between the diverse populations, and this is also reflected in the genetic data. The researchers analysed the genetic data in conjunction with other archaeological findings and new insights from climate models to increase their understand of the migration routes, settlement patterns and the first people to settle in Scandinavia as the ice retreated. Archaeological artefacts and isotopic analysis – which can tell us something about what people ate – help to fill out the picture. The new immigrants that came from the northeast learned new boating and fishing skills to access the marine resources, which offered their main source of food. The researchers discovered that these immigrants also introduced new tools and innovative ways to produce them. This shift in material culture can now be linked to a particular migration wave. “We expect that a migrating population comes with an entire cultural package – a knowledge of nature, ways of life, craft traditions, beliefs and other customs,” says Skar. “Now we can explore more closely how the relationship between the original and new populations evolved. The original inhabitants were highly skilled and adventurous seafaring hunters, whereas the new population was originally an inland people. Archaeologists can track the processes of change in their material culture,” she adds. People at that time were largely dependent on the ocean for food. They braved challenging climate conditions that required behavioural adaptations in the short term, and that in the longer term could lead to changes in the population’s genetic composition. “The two groups that migrated to Scandinavia at that time were genetically distinct. People from the south probably had blue eyes and dark skin, while those from the northeast had various eye colours and light skin,” says population geneticist Mattias Jakobsson from Uppsala University, another of the main authors. The genetic variation between the Mesolithic individuals from Scandinavia is surprisingly high, and greater than in the populations who lived in western and central Europe. This contrasts with the Europe of today, where the largest genetic variation is found in the south. The lighter variations of skin and eye colour more common in Scandinavia than in other parts of Europe also appear to have been the case at the time of the migrations. Pigmentation, now as then, tends to decrease the farther away a population group lives from the equator. We can assume this to be an indicator of climate adaptation. The results are presented in a research article recently published in PLoS Biology. The sample quality is very high. The remains of one of the individuals studied yielded aDNA results with the best coverage, or depth, achieved for any human being from prehistoric times. The abbreviation aDNA stands for ancient DNA and refers to the study of genetic data obtained from fossil subjects. The study’s somewhat younger remains from Steigen municipality in Nordland county were borrowed from the Tromsø University Museum. The study is part of the Atlas Project, funded by the Swedish Research Council, the Riksbankens Jubileumsfond and the Knut and Alice Wallenberg Foundation. The interdisciplinary collaboration between geneticists, archaeologists and osteologists provides us with significantly more insight into European and Scandinavian history.